Resources and information to help end abusive horse-drawn carriage businesses. The court indicated that NYPD’s position—first that they had no records, then that they had records but couldn’t share them with us, and today that they had records and could share them but ALDF had phrased our request poorly—was questionable. In a hearing on April 28, the New York Supreme Court sided with ALDF in an important case for New York’s carriage horses. 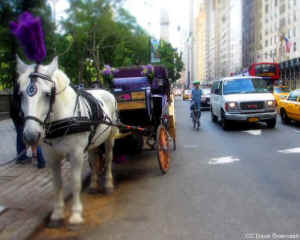 Last fall, after being denied access to public records by the New York Police Department (NYPD) for over a year and a half, ALDF petitioned the New York Supreme Court to force NYPD to turn over public records regarding the horse-drawn carriage industry. In today’s hearing, Judge Shlomo Hagler agreed with ALDF regarding our right to public records under New York’s Freedom of Information Law (FOIL, which is similar to the federal Freedom of Information Act or FOIA), and reminded New York’s finest that transparency and an open government are values to be taken seriously. The judge was emphatic about the validity of ALDF’s concern about the treatment (and mistreatment) of horses in the carriage industry. NYPD was instructed to comply with the request in the broad terms it was written. In fact, the judge ordered the NYPD to produce the documents within 45 days. The court indicated that NYPD’s position—first that they had no records, then that they had records but couldn’t share them with us, and today that they had records and could share them but ALDF had phrased our request poorly—was questionable. NYPD argued that they had no records because a horse getting hit by a car didn’t pertain to horse safety and welfare, but only to the car’s injuries. Like ALDF, the judge disagreed. “If there was a phone call of abuse of a [carriage horse] then I believe it’s your duty to give that record over,” said Manhattan Supreme Justice Shlomo Hagler to the NYPD.